The College of Engineering and the Student Chapter of the Louisiana Engineering Society at the University of Louisiana at Lafayette will celebrate Engineering and Technology Week beginning March 26. Events in conjunction with the week will showcase the many aspects of engineering and technology and the contributions that professionals in these fields make to society. McCutcheon is an internationally known expert in ecological engineering and phytoremediation, water quality, hydrology, hydrodynamics, sediment transport, cleanup of toxic organic materials and metals and environmental engineering. He is a director of the Board of the American Society of Civil Engineers, a past-president of the American Ecological Engineering Society and author of three books and numerous publications. The event is free to the faculty, staff and students of UL Lafayette as well as members of industry and the general public. Also on March 26, a Mystery Design Contest will be held for engineering students in Rougeou Hall at 7:15 p.m. Immediately following McCutcheon's presentation, teams of students from the departments within the college will compete and awards will be given for participation. Graduate students in the Engineering Department will have the opportunity to participate in the Student Poster Competition from 2 p.m. until 3 p.m. on March 27. Posters detailing graduate research activities will be set-up in the lobby of Dupré Library to highlight the UL Lafayette engineering graduate program and its significant contributions to society. The posters will be judged, and a $300 purchase allotment from the UL Lafayette Bookstore will be awarded to the student submitting the top poster. First, second and third place winners will receive a plaque at the Engineering and Technology Week Awards Banquet. The posters will remain on display through March 29. Students, industry, faculty, staff and the general public are invited to view the display. Undergraduate students will also have their shot at awards and prizes in the Undergraduate Engineering Student Paper Competition. The event will begin at 5:30 p.m. and last until 8 p.m. in Madison Hall room 101. A total of six undergraduate engineering students will compete as finalists in a technical paper contest. Each will present an overview of their paper in front of a panel of judges and an audience of their fellow students and college faculty. One cash prize of $500 donated by Mr. E.R. “Ray” DesOrmeaux will be awarded to the student with the highest combined score of written and verbal presentation scores. This is event is also open to students, faculty, staff, industry and the general public. The highlight event of the week will take place on March 28 from 8 a.m. until 2 p.m. Regional high school students have been invited to visit UL Lafayette and view numerous displays assembled by the students of each department within the college as part of Engineering and Technology Expo Day. More than 800 high school guests will tour the various engineering and technology departments and have an opportunity to interact with both the students and faculty of UL Lafayette. Industry representatives from more than 25 companies will also visit and participate as part of this day. This event is open to the public. Students from the College of Engineering as well as industry participants will participate in a networking event from 2 p.m. until 4 p.m. on March 28. Designed to provide an opportunity for industry sponsors and students and faculty to interact on an informal basis, each department's student organizations will host a barbecue, picnic or similar activity for socialization and networking. Beginning at 6 p.m. the Engineering and Technology Quiz Bowl competition will take place in Rougeou Hall room 324. This competition will put students of engineering and technology head to head in a competition organized by students and former alumni. 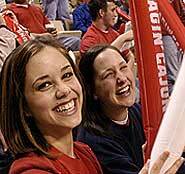 Questions submitted by UL Lafayette faculty will be directed at teams from each department in an elimination contest. The public is invited to attend. Niemeyer, prior to his current position, managed Chevron's Production Operations at the Giant Kern River Oilfield outside of Bakersfield, California at the time of the Texaco/Chevron merger in October 2001. He served as a Production Business Unit Leader for Texaco from April 2000 until October of 2001. Before assuming his position at Texaco, he served in various management assignments for increasing responsibility within Atlantic Richfield Company including the President of ARCO Environmental Remediation, LLC and the Vice-President of Engineering with ARCO Western Energy. Niemeyer graduated with a Bachelor of Science degree in Petroleum Engineering from the Colorado School of Mines in Golden, Colorado. He is a Registered Professional Engineer, member of the Society of Petroleum Engineers and a member of the Campaign Cabinet with United Way of Acadiana. For more information on any of these events, contact the College of Engineering at UL Lafayette at 482-6685.